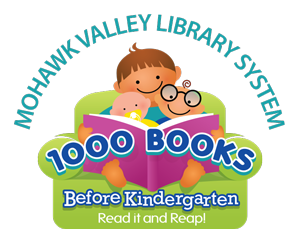 On behalf of the 1000 Books Foundation, the Mohawk Valley Library System and your public library, we invite you to participate in this free program which encourages you to read 1000 books with your child before he or she starts kindergarten. The concept is simple, the rewards are priceless. Read a book (any book) with your infant, toddler, or preschooler. Log each book you read. The goal is to have read 1,000 books together before your child enters kindergarten. To help you reach this goal, your public library in Fulton, Montgomery, and Schoharie county now has 1000 Books Before Kindergarten Bags and The Baby Bags ready for you to check out, take home and read with your child. Each 1000 Books Before Kindergarten Bag has ten preselected books on a wide range of topics and interests appropriate for most 3 to 5 year olds. If your child does not like one book, put it back and choose another to read! Each library currently has ten bags, which will rotate every two months. Each Baby Bag has five baby board books appropriate for babies and toddlers ages birth through 2. If your child does not like one book, put it back and choose another to read! Each library currently has five Baby Bags, which also rotate every two months. These bags are just a useful tool! Feel free to count all the books you read with your child – library, home, doctor’s office – and if you read a book more than once, you can record it each time. For each 100 books you read with your child, bring your app or log sheet to the library and receive a sticker. Gets an awesome jumpstart on success in school! The program has no end date except your child’s going to school, so don’t feel rushed – just enjoy the experience! Take every chance you have to read with your children, tell and talk about stories, say nursery rhymes, sing songs, and attend library programs. By reading just three stories a day, you and your child will have read over 1000 books in one year. You will also have shared many special moments along the way. Your library is a fun place featuring books to check out, free programs and great suggestions for what to read. Congratulations on giving your child a great head start on learning to read!